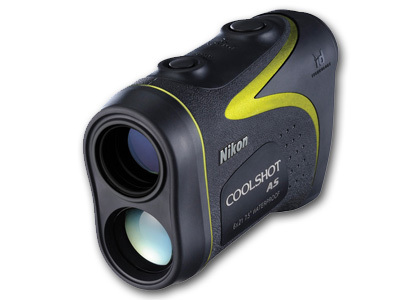 The CoolShot AS Laser Rangefinder from Nikon allows you to range distance on a golf course and in other range measurement applications. The monocular features a roof prism, multicoated optics, a 21 mm objective diameter, 6 x magnification power, and 7.5° angle of view. With this magnifying power and wide angle of view, you will see a field of 237' at the maximum range of 600 yards. The eyepiece has a diopter adjustment, an 18 mm lens, and 18.3 mm long eye relief. In addition to its optical features, it also features Pin Scanning Technology, First Target Priority Mode, Distant Target Priority Mode, and ID Technology. The Pin Scanning Technology is designed for ranging small targets such as pins. It performs an 8-second scan and displays range for the nearest pin from a series of scanned targets in the background. The First Target Priority mode is useful when holding the rangefinder still is difficult. This mode will compare all ranges obtained during the unsteadily aimed measurement, and will display a range for the nearest object. The Distant Target Priority Mode displays range to the farthest target from a series of scanned objects. The ID Technology calculates target height and slope-adjusted distance. The LCD can provide actual distance, horizontal distance, height, slope-adjusted distance, and display these readings in either yards or meters. It can indicate an incline or a decline and has LED illumination for low light conditions. This laser rangefinder is just over four inches long, weighs just over six ounces and has a rubber armor coating to ensure a comfortable grip. It features a water-resistant battery compartment, and a nitrogen-filled fogproof and waterproof housing. The waterproof housing is rated for immersion to a depth of 3.3' for 10 minutes.